Utilize your blog, video, audio, slides, or any media-based online tool to create a 3-5 minute presentation about your learning and assignments. Highlight your work and your own critical thinking. Create any digital artifact that explores your learning and the Hyperlinked Library: your own graphic of the model, an “info-graphic” style presentation, a song, etc. Since the initial deadline is less than a week away I have begun work on creating a multimedia presentation. In this post I will summarise the tools I’ve used. My aim is to provide a PowerPoint presentation with an audio soundtrack. The presentation will include examples of various tools which I have found useful and I will include links to the tools so that others who find them useful can easily access them. In order to create the presentation with an audio soundtrack I first used the open source Audacity tool to record my presentation and exported it as an MP3 audio file. I then uploaded the slides to Slideshare and used the edit option to include an audio track with the presentation: a Slidecast, as this is referred to. Once the audio had been uploaded I then had to sync the audio, so that my talk was associated with the specific slides. Note that as I have created Slidecasts previously I knew that it was advisable to leave a pause when speaking, which can make it easier to identify the audio portion for a new slide. The interface for doing this is shown below. Note than in order to minimise the number of “umms” and “errs” in the talk, I had previously created a script which I used while giving the presentation. This script will also be useful in providing a transcript, as requested by the MOOC organisers. I had observed that my talk was too long, lasting for about 10 minutes. Rather than remaking a shorter Slidecast I decided to use another tool, and to make the Slidecast available when I submit my assignment for those who may feel that the slightly longer version provides additional information which is useful. A fellow participant on the MOOC recently suggested the Screencast-o-matic tool which can be used for capturing screen sessions, with the free version able to make a recording of up to 5 15 minutes. Since the presentation had to be shorter I deleted a couple of slides and adjusted the script accordingly. I then launched Screencast-o-matic, positioned the recording window over the PowerPoint slides and began recording. This second presentation is still slightly too long. I may submit this version in any case. However if anyone has any suggestions for other tools which I could use, I’d be grateful. I hope these notes on the tools I’ve used will be useful for other MOOC participants who have not yet got found to selecting the tools they’ll use for the assignment. Thanks for the comment. 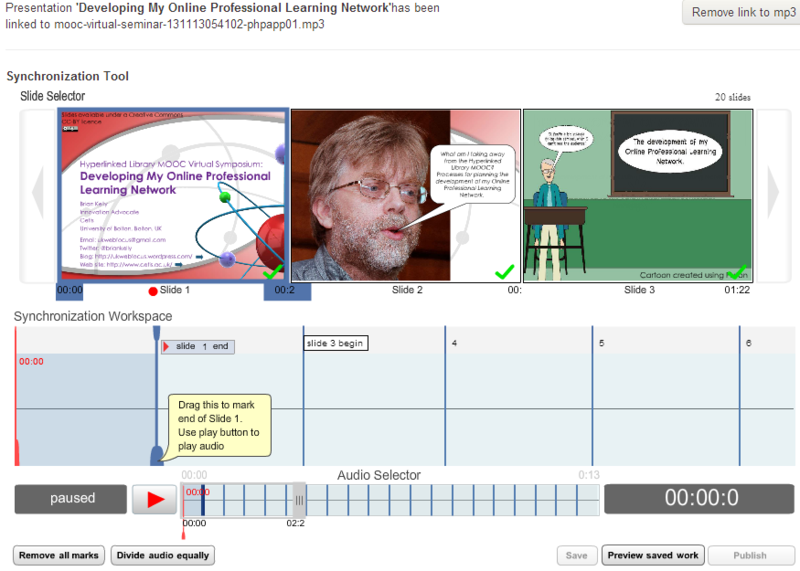 You also helped spot an error I made – the free Screencast-o-matic recordings can be up to 15 minutes long. I have updated the post. Thank you so much for sharing the steps you are taking to create your VS. You are a good teacher! Crikey, thanks for sharing all that info Brian. I’m very new at most of that so appreciate the help. Pleased to be of help. I always try and be open about the processes and tools I use for my work – it’s a key part of my open practices.